While you’d probably love to slow down and smell the pine during the holiday season, let’s be honest—that’s usually not an option for marketers. It’s crunch time and you’re working hard to tie up loose administrative ends, manage holiday campaigns and prepare to start the New Year stronger than ever. But despite your busy schedule, you’re always on the hunt for ways to boost your content marketing efforts. Am I right? 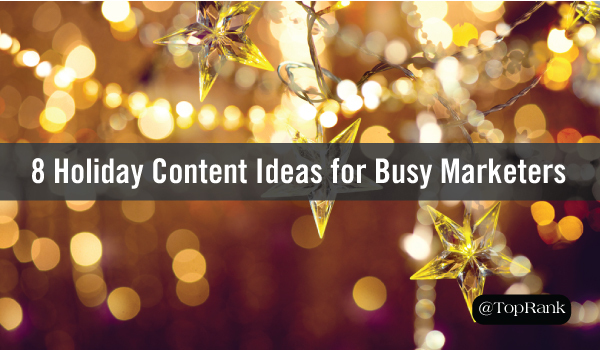 Well to help you out, below are a handful of last-minute content marketing ideas that are easy to execute and keep you connected with your audience through the holiday season. #1 – Create a roll-up post featuring your most popular blog posts of the year. Highlighting your most popular blog posts of the year is a great way to give your audience a nice recap of the great content you’ve created, as well as send a little extra readership to those posts. For many marketers this is a go-to piece of content during the holiday season, but there are certainly ways to make yours stand out. For each post you feature, provide a brief summary of what it was all about and link to the article to make it easy for people to read more. In addition, consider adding interesting reader comments or pull tweetable quotes from the article that are easy to share. 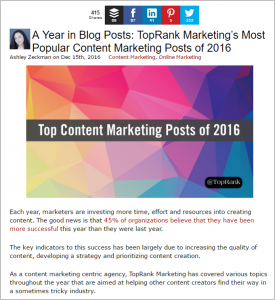 As an example, TopRank Marketing recently published a series of these roll-up posts by tactic, featuring our most popular posts on social media marketing, content marketing and influencer marketing. #2 – Recap interesting industry news items from the past year. The holiday season is a time of reflection. So why not give your audience a little reminder of the interesting, strange or even controversial industry news items that made headlines in the past year? TechCrunch recently published a piece on the top biotech stories of the year in a unique timeline format. Upfront it provides a high-level view of what’s to come and then invites readers to “strap in” for a ride down memory lane. If you don’t have time to create an interactive piece like TechCrunch, use the same format suggested for the roll-up piece above. But beyond providing a brief summary and link, consider adding your own perspectives on the subject or predictions for what you believe is to come next. #3 – Connect your content to iconic holiday themes and symbols. Marketers are always looking for ways to connect their content to timely news and industry happenings that are top of mind for their audience. Why not apply that same logic to the holiday season? A great recent example of this concept in action comes from LinkedIn Marketing Solutions. In one of their recent blog posts, they detailed the content marketing origins of the beloved “Rudolph the Red-Nosed Reindeer” story, while also highlighting the favorite holiday songs of industry influencers. Of course, gift giving has become a huge holiday tradition. Consider putting together a last-minute holiday gift guide that’s relevant to your audience. Here’s an example from Adobe. #4 – Offer a sneak peek of what you have planned for 2017. In addition to being a time of reflection, the holiday season also has us looking toward the future. Give your audience a little sneak peek of what your company has in store for the coming year and beyond. Of course, a blog post is a great way to get the word out about new products and ventures, but I suggest adding a visual element to make it more personal and impactful. If you create a video, embed it within a blog post and upload it natively on your social media pages to make it easily accessible and shareable. If you go for photos, I’d suggest a photo series with captions that have a storytelling element. #5 – Utilize your email list. Email is one of the most effective marketing tactics because your subscribers are a captive audience. By subscribing, they’ve letting you know that they’re interested in what you have to say. While you may want to get one more reminder out for a special holiday offer, you can also use your list to just send a heartfelt, simple greeting to your most loyal following. Here’s a recent example of the latter from Onalytica. #6 – Show off your company’s holiday spirit on social media. Social media is a fantastic brand awareness tool, allowing you to connect with your audience on their turf and show off a little personality. During the holiday season, show your followers how you’re celebrating as a team. 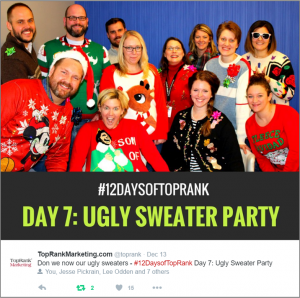 At TopRank Marketing, members of our leadership planned and launched #12DaysofTopRank, with each day featuring a different theme or team activity to get us all in the holiday spirit. Of course, we shared the fun on our various social media channels. #7 – Thank your customers. A little customer appreciation can go a long way. After all, your company wouldn’t be where it is without your customers. Show your appreciation (and give sales a little boost) by presenting your customers with an exclusive discount or offer via email. Or profile some of your top customers on your blog, featuring details about their business and how you’ve worked together to accomplish something. #8 – Provide useful insights and tips for the coming year. At this time of year, everyone is looking forward accomplishing personal and professional goals in the coming year. Create an ungated asset or blog post that features helpful tips or insights to help them keep those resolutions. If you really want to make it resonate, reach out to industry influencers and ask them to contribute. This content will not only inspire your audience to do better in 2017, but also connect your brand with something of value. How are you boosting your content marketing efforts this holiday season? Any tips you’re willing to share? Tell us in the comments section below.